Artichokes were introduced to the US from Italy in the 1920s and have been a favorite since. 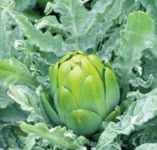 Usually sown as a tender perennial, they need at least 250 hours of temperatures at 50 degrees F or below to form buds and require some special handling during the first year of growth. Sow seed in January or February and keep the temperature around 75 degrees F for germination. Transplant to pots and keep at 50 degrees F or below, but protect them from frosts. You will find that some plants are albino or are weak - discard those and keep only strong green plants. Transplant to the garden when soil temperatures have warmed to 50 degrees F. After harvesting the first year's growth, trim off the plants to about 8-10 inches above ground and mulch. Uncover the following April. Some varieties are best grown as annuals and should be replanted each year. These are better for colder climates. Green Globe (360 days) OP - Grown as a perennial, this variety has green buds tinged with purple that measure 3-5 inches in diameter. Best perennial variety north of Zone 7. Imperial Star (90-100 days) H - A good annual variety that prduces buds the first year from seed. 6-8 inch buds are nearly spineless and average 3-4 inches in diameter.